Three variations on a theme... Beo4 over the years. From the Mark I version introduced in 1994 with its central 'AV' button, the Mark II version introduced in 1999 to accommodate the then recently introduced DVD format, and the November 2004 Mark III inception with its noticeable DTV, VMEM and AMEM buttons. 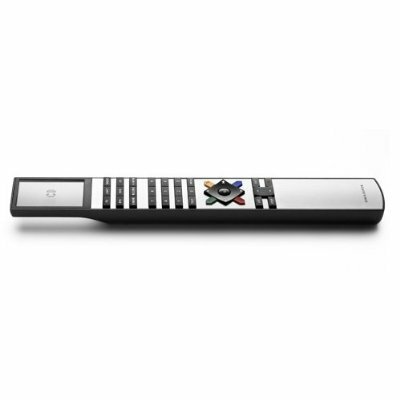 Beo4 is the key to many Bang & Olufsen television and music systems. A remote control must be able to be operated in the dark, without glasses and without moving your eyes from the screen. That's why the most often-used controls on the Beo4 are gathered together on one multi-functional button which you can control with just your thumb: programme shift, video play and wind. Choose a function and your command is registered on the Beo4's LCD display. Simple and logical, so the manual can be put away after a few days. The design is ergonomical and so tough that Beo4 can be left in the hands of the youngest user. Beo4 Wall Bracket - Aluminium - Excellent Condition.